I'd say that Spyderco's history is somewhat of a American dream. It all started back in the mid 70's in California when Sal Glesser and his wife was looking for jobs. After a while they decided to take their faith in their own hands and start their own business. Sal's inventiveness generated The Portable Hand; a workshop tool fixating objects during processing. As the tool resembles a spider; the Glesser's named their company; Spyderco and created a spider like logo. They went all in with their company and lived in a van that worked as the couple's home and office on wheels. The dedicated knife collector Sal soon invented the sharpening system Tri-Angle Sharpmaker; a portable sharpener using ceramic rods to enable a consistent bevel angle when sharpening. In 1981 Spyderco launched their first knife; the model C01 Worker. This original knife featured all the characteristics that today's Spyderco folders have. The Spyderco C01 Worker offered for the first time an one hand opened folder using a hole instead of a thumb stud. Also the belt clip was new to the business. Since then Spyderco has delivered over 200 different knife models and has gotten established as one of the best known folding knife manufacturers in the world. Besides the fact that the Glesser family themselves are excellent knife designers, co operations with different premium knife designers is one of Spydercos characteristics. Knife makers like; Bob Terzuola, Al Mar, Ken Onion, Blackie Collins, Wayne Goddard, Bill Moran and Frank Centofante have all contributed to a number of classic models in the Spyderco portfolio. It's a fascinating journey the Glesser family have done; going form unemployed to a successful global company. Since 1997 Spyerco has their head office in Colorado and the son Eric Glesser has started to shoulder the proud history of the company together with the about 150 coworkers. Most of us probably think of folders when we hear the name Spyderco. But today the company also offer a wide range of fixed blades. One of the more resent models is the FB26GP Bushcraft. The model is developed in cooperation with Chris Claycomb and Bushcraft UK. 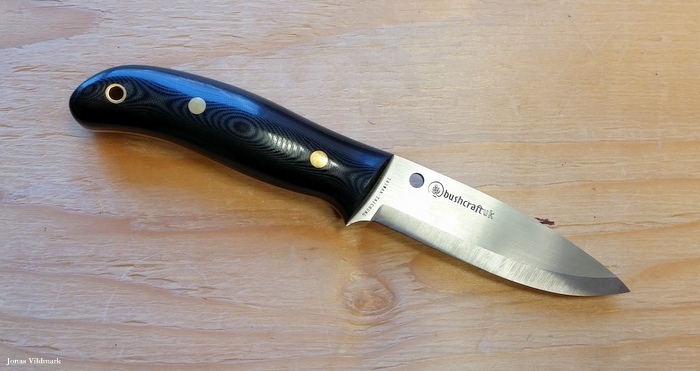 The knife has all the characteristic features defining a modern bushcraft knife; a carbon steel blade (0-1) using a drop point shape and a Scandi grind (25° angle) and a sharp blade spine. The 3,6 mm thick full tang is surrounded by G-10 scales fixated by brass rivets creating a very meaty and comfortable handle. The knife's center of gravity is located pretty far back in the shiny and nicely shaped handle. The knife is a very nice wood caver but my helping left thumb gets a bit soar from the very sharp blade spine at the blade tip. Also a unnecessary sharp edge could be found on my knife at the discreet finger guard. But both these hot spots was easily removed using a peace of grinding belt. The black premium leather sheath is made of 3 mm thick leather and nice craftsmanship. The six sheath rivets enables a number of interesting attachment possibilities. Spyderco Bushcraft ended up in 7th place in my bushcraft knife field test. I love the edge of this knife but the total weight and balance caused loss in the total score. The FB26 is a very luxurious and robust forest knife that delivers an impressive edge straight out of the box. The knife weight of 227 g makes the FB26 the second heaviest knife in my test. The voluptuous handle fits big hands and gloves very well. If you prefer stainless steel and a full flat grind; I recommend you to take a look at the younger sibling Spyderco FB36 Proficient. Copyright © 2009-2019 Jonas Vildmark. Powered by Blogger.